If you’re looking to push yourself and take your workouts to the next level, consider coming to Boot Camp class at the Y—it’s a free class for members. Boot Camp classes often change things up so that your body doesn’t get used to the workout, and is continually challenged. Exercises are designed to help boost cardio endurance, increase strength and improve agility. Classes will make use of Y-provided fitness equipment like BOSU balls, weights, boxing bags, jump ropes and more. 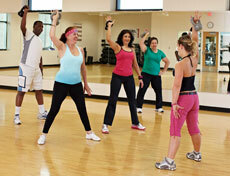 Boot Camp features a great group dynamic, plus instructors will create a fun environment and push you to work hard. For extra motivation and built-in accountability, plan to attend this class with a friend. If you’ve been working out on your own and want to kick things up a notch, or if you’re looking for solid cross-training options—this is the class for you. For example, if your sport-specific training has hit a plateau, Boot Camp could be the ticket to get your muscle memory out of a run and help you see results. This class is an excellent workout—whether you’re new to the gym, or training at peak performance. Instructors are trained to offer modifications for all the exercises, so that everyone can work at their own level. And remember—this class is for you, so try to avoid comparing yourself to others and be empowered to work at the level that’s right for your body and your limits. Find a Boot Camp class.